The ABRF laboratory contains two Ion Trap Mass Spectrometers, a Thermo Finnegan LTQ XL/ETD Linear Ion Trap and a Bruker Daltonics' AmaZon ETD/PTR 3D Ion Trap. 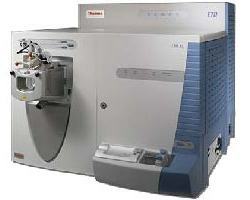 These Mass Spectrometers (MS) give researchers a wide range of options for sample analysis. Both MS systems are attached to individual Nano-Flow, Ultra Performance Liquid Chromatography (LC) systems allowing efficient peptide separation prior to MS analysis. Alternatively they can be used without online LC to directly inject non-complex samples into the ion source via on-board syringe pumps. Our Ion Traps are generally configured for Nano-Flow, Electro-Spray Ionisation (ESI) MS, however options are available for both Micro-Flow ESI and Atmospheric Pressure Chemical Ionisation (APCI). Detection is possible in both positive and negative ion modes. The LTQ and AmaZon are both capable of collecting full MS and MS/MS data (up to MS10) in both data dependent and independent processes using multiple forms of MS/MS dissociation which make it possible to get more information out of your sample particularly for the analysis of PTMs. LTQ Pulsed Q Dissociation (PQD) and AmaZon PANorama Fragmentation (PAN) extends the mass range in MS/MS mode to allow observation of low mass reporter ions. The AmaZon is also capable of performing Proton Transfer Reaction (PTR) which when used in conjunction with ETD can enable the sequencing of larger peptides or intact proteins and their PTMs via "top-down Proteomics"
Bruker Daltonics' micrOTOF-Q II is configured with an Apollo ion source followed by an ion transfer stage which guides the ions into an analytical quadrupole and collision cell for accumulation of parent/fragment ions prior to mass analysis in the Time-of-Flight mass spectrometer. As with the LTQ the micrOTOF-Q II is connected to a split-less Nano-Flow Liquid Chromatography system for Reversed Phase pre-separation of sample to reduce complexity when analysed by the Mass Spectrometer. The ion source is generally configured for Nano-Flow, Electro-Spray Ionisation (ESI) MS, however options are available for both Micro-Flow ESI and Atmospheric Pressure Chemical Ionisation (APCI). Detection is possible in both positive and negative ion modes. A syringe pump is also available for direct injection of sample into either the Micro-Flow ESI or APCI ion sources. The Q-ToF offers an increase in resolution and mass accuracy over the Ion Traps, yet it does not possess the varied options for ion fragmentation and is not capable of performing MSn analysis beyond MS3 (Pseudo MS3 possible with In Source Decay). 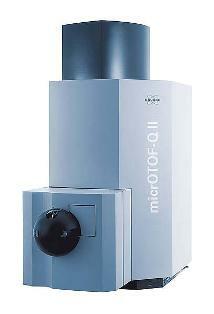 With mass resolution of better than 17,500 and mass accuracy of 1-2 ppm the new micrOTOF-Q II is a high-performance system for many analytical challenges, including identification and quantitation in LC/MS/MS proteomics, metabolomics and other small molecule applications including highly confident formula determination of small molecules (up to 1kDa) using Bruker's SmartFormula.